Short Annapurna Base Camp Trek design for those having limited days. 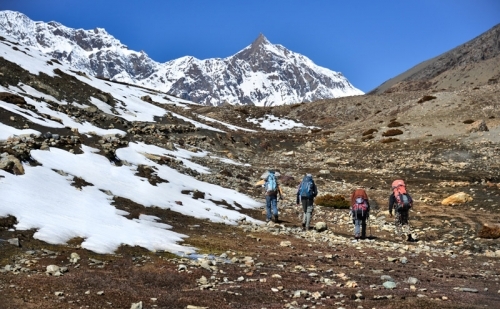 Trekking with local, experienced and hospitable guides and porters. Our staffs are trained and licensed from the Nepal government. Trekking with minimum impact in the local environment with choices of lodges using alternate fuel and following proper garbage disposal. Overnight stays in villages with great views avoiding altitude sickness. 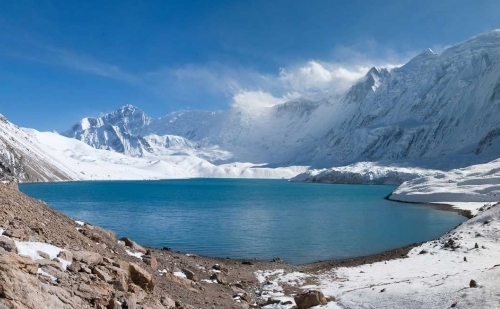 Green Valley Nepal Treks designed 10 days (Arrival to departure) short Annapurna Base Camp Trek for those having limited days and still want to reach the wonderful Annapurna Base camp. 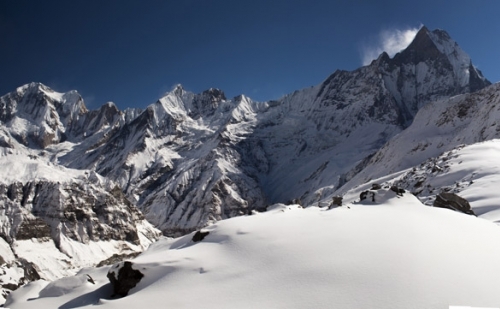 Short Annapurna base Camp trek is a moderate trek suitable for almost everyone as the trail is comparatively easy and appealing. 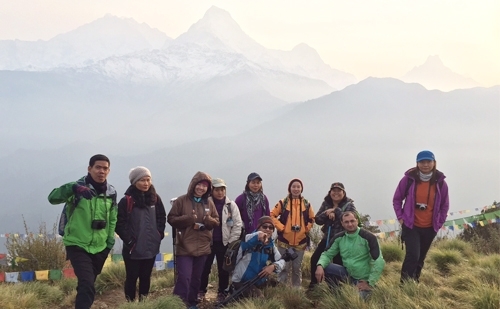 Short Annapurna Base Camp Trek starts from Pokhara, the natural capital of Nepal. Pokhara is known as Lake City with an amphitheater of mountains. Annapurna range makes its northern wall. 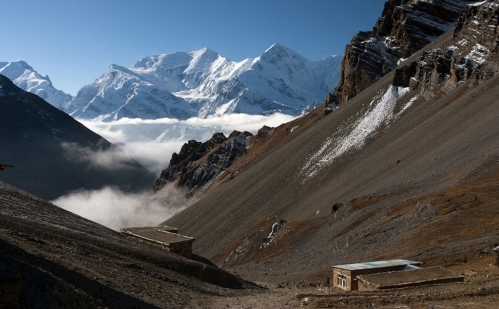 This is a base for several treks in the Annapurna and Dhaulagiri ranges. We drive 44 km / 1.5 hrs to the trekking trail head at 1,100 m from Pokhara and start our trek to Ghorepani first. Ghorepani or its top Pun Hill (3,200 m) offers view of about 15 snow peaks including Dhaulagiri I (8,167m / 7th highest), Annapurna I (8,091m / 10th highest) and Manaslu (8,156m / 8th highest). This is the good start of the trek. Then we will walk through the rhododendron forest to Chhomrong village across the Annapurna South. From here one can enjoy the heights of Annapurna South and Fishtail. The trail further enters into the narrow valley wedged between Annapuran south and Fishtail. 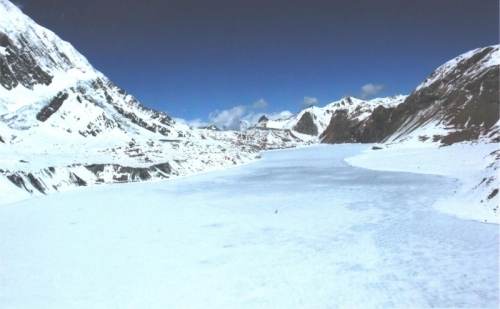 At Fishtail base camp (3,700 m), we come to meadows and glacial moraine with relatively bright and wide valley. 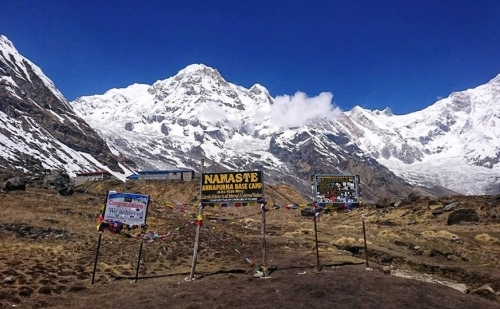 Annapurna base camp (4,200 m) has snow peaks at 360 degree. Day 01 :Arrival in Kathmandu (1300m. )Green Valley Nepal Treks Airport Representative will meet you at the Tribhuwan International Airport. A drop to the Hotel by private tourist vehicle is arranged. You can either take a rest or meet us at our office and know the detailed arrangement of the Trek. Day 03 :Pokhara to Chomrung (2020m) Via Jhinu dada (2 hrs drive, 5 hrs trek) Drive from Pokhara to siwi by JEEP. 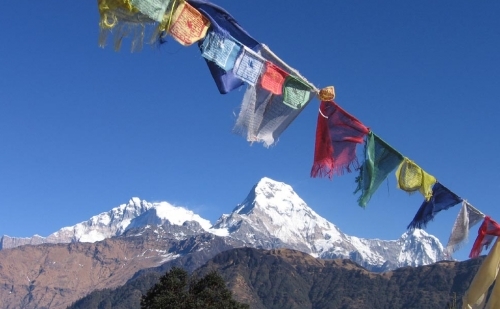 Then trek to Jhinudanda, we will have lunch in Jhinudanda From here, a straight climb takes us to Chhomrong, a beautiful village situated in the lap of the Annapurna. Day 04 :Trek from Chhomrong to Dovan (2580m) (6 to 7 hrs) Stone steps from Chhomrong drops down to Chhomrong Khola, where we cross a suspension bridge. Then we take a steep climb to Sinuwa. After a short walk along the jungle, followed by an easy downhill, we reach Bamboo. Passing the damp bamboo forest, we take the steep descent to Dovan, the bottom of a gorge. Day 05 :Trek from Dovan to Deurali (3230m) ( 5 to 6 hrs) The walk from Dovan to Himalaya is a silent one as big noises are not allowed in the jungle in regard to a temple on the way. The route first comprises bamboo forests and then changes to rhododendron forests and contains plenty of waterfalls. Upon reaching Himalaya, clearings appear and glacial rivers are visible along the trail as we ascend to Hinku cave. After a short walk, the trail first drops to the river and then ascends again to reach Deurali that offers exotic views of the valley below. Overnight stay at a guesthouse in Deurali . 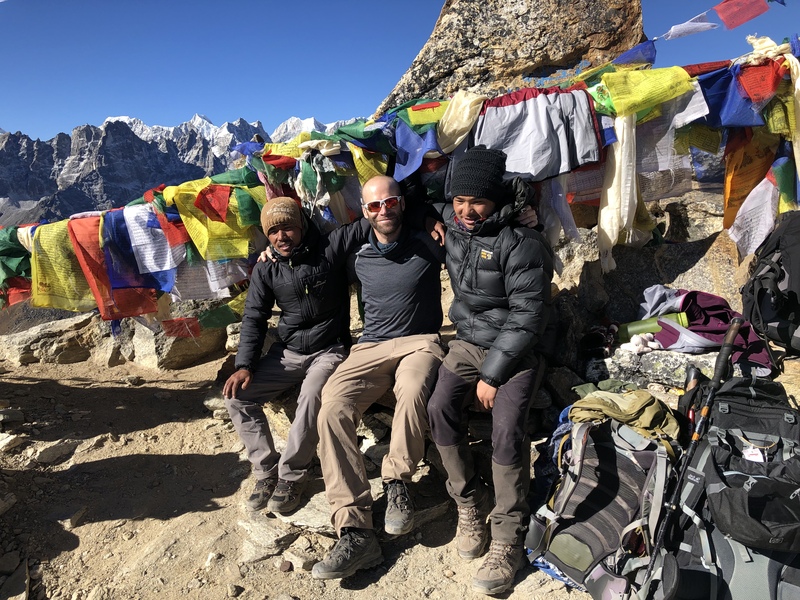 Day 06 :Trek from Deurali to Annapurna Base Camp (ABC) (4131m) (4 to 5 hrs) From Deurali, the trail passes through a river bed, and after a tedious climb, we reach Machhapuchhre Base Camp. Surrounded by mountains on all sides, views of Annapurna, Machhapuchhre, Gangapurna, Himchuli et cetera are very rewarding. The way to ABC is wider with scanty vegetation. As the area is prone to avalanches, caution should be taken on possible dangers. Up from MBC, mountain views unveil to clarity. 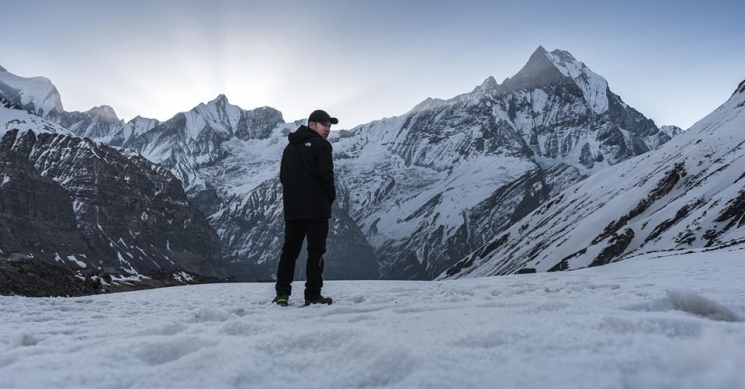 Annapurna Base Camp gives an awe-inspiring view of the snow covered mountains including the Annapurna range, Singuchuli, Macchhapuchhre, Tent Peak et cetera. Overnight stay at guest house in ABC. Day 07 :Trek from ABC back to Sinuwa (2340m) (7 to 8 hrs) After viewing a spectacular sunrise from ABC, we head back following the same trail through MBC, Deurali, Himalaya and Bamboo all the way to Sinuwa. Mostly downhill, the trail is an easy walk. Overnight stay at guest house in Sinuwa. Day 08 :Trek from Sinuwa to Jhinu Hill (2170m) (4 to 5 hrs) From Sinuwa, we move ahead to Chomorong. After a descent of about 45 min, we reach Jinuwa Guest House. Jinuwa is known for its natural Hot Spring where you can take a relaxing bath. The spring is a 30 min steep walk from the guesthouse. Overnight stay in guest house in Jhinu. Day 09 :Jhinu Hill to Siwi – drive to Pokhara airport – fly to Kathmandu (3 hrs trek, 2 hrs drive, 30 minutes flight) After breakfast in Jhinu, continue trek to Siwi taking the route along the Modi Khola. From Siwi we will take private vehicle to Pokhar airport to fly Kathmandu. It will take about 2 hours. Then we will take scenic flight to Kathmandu it will take about 30 minutes. Green Valley Nepal Treks airport representative will pickup you and drive to Hotel. Evening you could explore around Thamel. Day 10 :Transfer to Kathmandu International Airport After breakfast you could explore around Thamel yourself, last minute shopping etc; as you departure time I will drop you to Kathmandu International airport.